As with terrestrial agriculture, shellfish farms address growing food demands at home and abroad. Watch this educational video about shellfish farming on the U.S. West Coast. This short film provides information on different farming methods and types of shellfish grown as well as the environmental & economic impacts (Narration by Bill Dewey of Taylor Shellfish). Bivalve shellfish farming is an aquaculture practice in which shellfish such as clams, mussels, and oysters are raised for human consumption. Along the West Coast, shellfish aquaculture typically takes place in sheltered estuaries and bays. 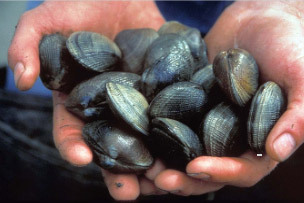 While some commercially important bivalve species settle naturally and in large enough quantities for commercial or tribal harvest, most shellfish farmers are dependent on seed reared in hatcheries. Once seed is acquired, there are a variety of different culture methods and technologies, the use of which depends on the species, environmental conditions, and the preference of the grower. Oysters, for example, can be grown directly on the beach, placed in protective grow bags, or suspended above the sediment on longlines or from rafts. Similarly, most clams for commercial production are cultivated under protective netting or in bags buried in the sediment. Farmers of the native geoduck clam, the world’s largest clam, typically place a tube around each clam for the first few years to protect their crop from predators. Mussels are almost exclusively grown on lines suspended from rafts or other floating materials. Shellfish production on both private and public lands has been a traditional activity along the West Coast since the 1860’s, and in the past three decades, advancements in hatchery and culture practices have improved and expanded to include additional species and cultivated habitats. Extensive estuarine areas in the state are currently used for commercial cultivation of oysters (Crassostrea gigas, Crassostrea virginica and others), Manila clams (Ruditapes philippinarum), native geoduck clams (Panope generosa) and mussels (Mytilus spp.). West Coast shellfish aquaculture plays an increasingly important role in domestic production of seafood. The West Coast is home to more than 300 commercial shellfish farms and 5 major private hatcheries, which produce a farm gate value exceeding $228 million and account for two-thirds of all oyster, mussel, and clam aquaculture sales in the U.S. The commercial shellfish industry is also a large private-sector employer in West Coast coastal counties, supporting more than 3,800 direct jobs. Beyond the socioeconomic impacts of shellfish, the shared biogeochemical functions of nutrient remediation, water clarification, biodeposition, and habitat creation make all suspension-feeding bivalves a valued provider of ecological services to the shallow-water ecosystems. A single adult oyster can purge 60 gallons of water a day. 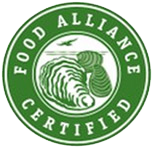 Indeed, shellfish are one of the best options for ecologically sustainable aquaculture and have the potential to significantly contribute toward the growing demand for seafood in the U.S. and abroad and to reducing the Nation’s $10.4 billion seafood deficit. In addition to meeting domestic and international demand for seafood, shellfish aquaculture is also a popular discussion point among those interested in how we might produce protein more efficiently. Shellfish aquaculture requires no feed additives, as bivalves take the nutrients they need directly from the water column, and holds great potential for relieving pressure on wild seafood stocks and land-based protein sources. In fact, "the Monterey Bay Aquarium’s respected Seafood Watch program rates both farmed mussels and farmed oysters as a "best choice."